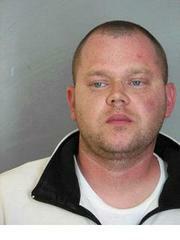 Date of Occurrence: Wednesday, May 4, 2011 at 11:20 p.m.
Newark- The Delaware State Police have arrested a 30 year old Wilmington, DE man on drug and traffic charges after he led them on a short vehicle pursuit last night. The incident began at approximately 11:20 p.m. last night as a trooper conducting speed enforcement on New Linden Hill Road, Newark, stopped a Buick Lacrosse for speeding. As the trooper approached the vehicle, which had pulled over on Upper Pike Creek Road, the driver sped off. Troopers, with the assistance of the Delaware State Police helicopter, then pursued the vehicle and after a short amount of time, were able to box the vehicle in on New Linden Hill Road. The operator, Nicolas Jamison, was then removed from the vehicle without incident. A subsequent computer check revealed that Jamison was operating the vehicle with a suspended driver’s license. A search of Jamison’s vehicle was then conducted at which time two plastic bags containing a total of approximately $5900.00 in cash along with a pill bottle containing 188 Oxycodone tablets and 17 Diazepam tablets was located. Nicolas Jamison was arrested and charged with the above list of crimes. He was arraigned at the Court of Common Pleas and then committed to the Howard Young Correctional Facility for lack of $11,202.00 bail.